When it comes to losing fat from specific areas, it is hardest to tone arm fat. A strong upper body is on the dream list of most people. Of course, a strong upper body is great for completing your everyday tasks easily such as carrying heavy bags, your heavy suitcase, or using your arms to pull yourself out of the pool. But, in order to get toned and bigarms,you think you will also have to go for that expensive gym membership. Not, necessarily! You can work your bicep, triceps and your entire shoulder girdle right inside your room! Check out the bicep and triceps workouts with dumbbells here and get your torso back in shape. So, what kind of exercises should you do to add muscles and lose fat from your arms? These 10 biceps and triceps exercises work really well. Start with low weights and as you get used to it go higher on weights. When you do the incline dumbbell curl, your arms move rightbehind your body. This gives a nice stretch to the long head of the biceps, which moves over your shoulder joint. Just sit on an incline bench and grab dumbbells in each hand keeping them at arm’s length. Now, with the help of your biceps curl the dumbbell till it reaches your shoulder, then bring them down to your side and repeat the entire movement. It is a great way to work the back of your arms, it also adds strength to the muscles in your chest and the front of your shoulders. Lie down your back on a flat bench and keep your feet planted firmly on the floor. Keep your arms right over your chest, grabbing a dumbbell in each hand. Turn your palms in a way that they are facing and helping them “crush” the dumbbells right against each other. Now as you push the dumbbells together, bend your arms and lower the dumbbells down right to the middle of your chest. Reach your arms in a way that they extend over and bring them straight up and over your chest again. Press back up and get right back to the starting position. This is a great workout for your torso and strengthens the muscles in the front of your shoulders and also in the back of your arms which adds strength to your upper body. Stand in a way that your feet stands shoulder-width apart. Now, hold a dumbbell in both hands, elbows out and your palms facing forward. Next, press the dumbbells overhead while you extend your arms, pushing your feet towards the floor, while you push your hips forward and straighten your legs. Bring them in the overhead position and then back to your shoulder level. Repeat. Work your triceps with this one.This is a single-joint exercise that focuses on triceps, especially the ones on your upper arm. 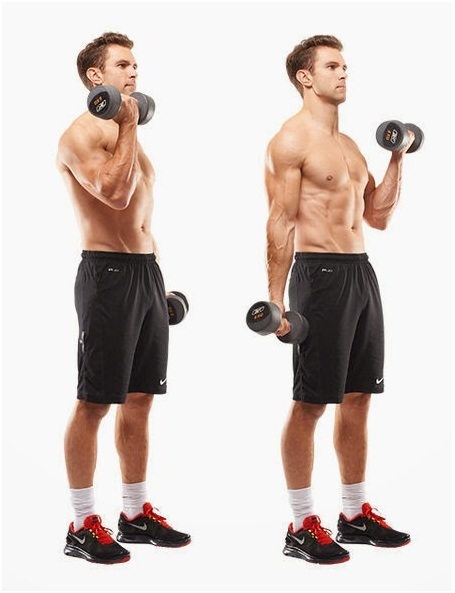 Stand up tall with one dumbbell while you keep both hands behind your head keeping your upper arms pointing right up. Now lift your dumbbell up by curling your elbows and bring it back to the starting position. Don’t move your upper arms, keep them still throughout. The triceps extension is a single-joint exercise that helps target triceps and the muscles on the back of your upper arm. It adds variety, isolation effect, and convenience. Stand up while you hold one dumbbell with one hand right behind your head keeping your elbow at a 90-degree Keep your upper arm straight up. Raise the dumbbell with one hand just short of being fully extended and then slowly bring it back. Alternately raise one arm after the other. Don’t move your upper arms, keep them still through the entire exercise. Seated concentrated arms are a great way to get killer biceps. Sit on a bench while you keep one hand against your thigh and get hold a dumbbell with the hand down right between your legs your palm facing the other leg. Lift the dumbbell until it is high enough to reach your shoulder and bring it back down after a short interval. Once done start with the other arm. Keep your upper body still while you do the entire exercise. This kind of dumbbell curl stimulates your biceps more than the other arm exercises. Stand up and hold one dumbbell in each of your hand, now bring them down the side of your body ensuring your palms are facing each other. Lift both your dumbbells till they reach your shoulder height and bring them down after a short time. Keep your upper body still while you complete the exercise. Hammer curls not only works your biceps, but these two muscles work in tandem to flex the arm at the elbow. Hold one dumbbell in each hand right along the sides of your body your palms facing your body. Raise both your dumbbells as you curl your elbows and lower them down after a short interval. Keep your upper arms still as you perform the exercise. If you want big biceps, you need to add more curls to your routine and alternated bicep curl is just one of them. Stand up and hold one dumbbell with each hand and bring it down the side of your body, in a way that your palms face each other. Lift one dumbbell until it reaches your shoulder’s height and while you lowerit back down after a mini interval, then start with the other one. Keep your upper body still as you lift weights. Preacher curl helps give you a greater bicep peak. Place one upper arm against your arm pad the other at a 90-degree angle and holdone dumbbell in each hand as your palms face each other. Try to keep your upper body still while you perform this exercise.